E-learning resources have a number of advantages over book and paper based resources. In this article, I’m going to write about one in particular: the importance of being able to edit the resources that you use with learners. This article focuses directly on resources for learning English as a Foreign Language (EFL) and English as a Second Language (ESL) as they provide very clear examples of why it is important. Why would you want to edit learning resources? Apart from obvious reasons, such as changes to the syllabus, correcting typos, correcting wrong answers and other such errors, it’s a great advantage to be able to edit resources to bring them into line with other resources to create more coherent, better targeted courses. Frequently, e-learning resources are used in combination with classroom, task-based and other types of learning activities, otherwise known as blended learning. Under these circumstances, it’s desirable to limit the scope of what learners are exposed to in order to help them focus on the core curriculum. In the case of EFL/ESL lessons, you’ll most probably have more success presenting and practising the same 8-12 new words and expressions in the classroom and on-line than if you present one set of vocabulary in class and another, different set on-line. There are plenty of very good and very effective photocopiable resources and self-study materials for EFL/ESL learners to learn and practise with. The difficulty arises when we try to construct a coherent, well focused lesson or course with a core syllabus using these resources. For example, if a lesson covers comparative and superlative adjectives and transport and travel vocabulary but the photocopiable resources for adjectives cover lifestyle vocabulary, and the resources for transport and travel vocabulary cover the Present Perfect, then we’ve just doubled the amount of new language being simultaneously presented and practised. For many students, having to grapple with two lexical areas of vocabulary and two areas of structure and use at the same time can be overwhelming and confusing. Futhermore, for any language that we expect the learner to remember and use correctly, a certain amount of practice and repetition is necessary so we need a series of different types of activity to recycle the target language. Photocopiable resources and self-study materials tend to cover each language point once, therefore learners usually need more resources from other sources. If we use a photocopiable resource in one instance to learn and practise vocabulary in a particular lexical area, such as transport and travel for Intermediate students, the specific vocabulary can vary from resource to resource since photocopiable resource authors often have different ideas about what the vocabulary for a particular lexical area for a particular level of English should be. This can result in learners being expected to learn more new vocabulary than is reasonable in a given length of time. If we were to add yet more resources, the amount of language presented quickly becomes unmanageable. Currently, a lot of teachers spend a lot of time adapting or rewriting resources because they are inappropriate for the language points that they are teaching. How does e-learning have an advantage over other resources? Books and worksheets, our most familiar learning resources, are published in what’s known as hard copy, in other words, on paper. Unless we get heavily involved with Tippex, scissors, tape and glue, these resources are essentially uneditable. E-learning resources differ from this in that they are stored electronically and can be easily copied and edited, so having your texts and pictures in MS Word or Open Office Writer documents means that you can copy and paste any of them into a new resource and edit them and publish them as necessary. With Google Docs you have the added bonus of having the resources available in one easily accessible place. To avoid copyright infringement issues, I recommend only using your own original content or Creative Commons content (Wikipedia, Flickr, Wikimedia, etc.) for this and properly acknowledging all authors and contributors. Electronic documents are somewhat more convenient than hard copy resources but, of course, computers and software are capable of making our lives much easier by generating learning resources that are multimedia and interactive and hosting them on the Internet where learners can have access to them anytime and from anywhere they have an Internet connection. Here, I’m talking about dynamic learning resources supported by learning management systems. Dynamic simply means that the resources are generated by software automatically so all we need is the resource content, i.e. text, questions, answers, images, audio and sometimes video, in an appropriate format. An e-learning application, usually Flash or Java based, can read the learning resource content and create a unique learning resource. In the world of e-learning this is called a learning interaction. A learning interaction can be as simple as a page of text and images or it can be a highly interactive grammar game or self-correcting dictation. The beauty of this “data-driven” model is that we only have to author the learning resource content once. After that, we can use it, dynamically (i.e. automatically) to create any number of different learning interactions. All we have to do is substitute different e-learning applications that can read the learning resource content. E-learning applications can be word searches, dictations, multiple matching, multiple choice, true or false, short answer, gap-fill, written answer dialogues, spoken answer dialogues, listening activities, shadow reading activities, subtitled video, tests, etc. From just one set of learning resource content, it’s possible to create any number of learning interactions that focus on developing learners’ skills and knowledge. An added advantage of this model is that it encourages learning resource designers to recycle language more frequently thereby ensuring that learners get adequate practice. You can see an example of this on the demo course on my learning management system (login as a guest). On the demo course, the learning interactions “Word Search”, “Listen and Select” and “Look and Describe” all share the same learning content. If we edit the learning content, the changes are immediately reflected in all the learning interactions. We can also create a new set of learning content by copying and the original set and editing it to suit another purpose. Again, with this new set of learning content, we can dynamically create any number of different learning interactions. This idea of keeping learning content and learning applications separate and combining them to create learning interactions can reduce course content development time dramatically. With a relatively small library of learning applications and learning content, it’s possible to provide hours of effective, engaging, varied, high-quality learning interactions in a very short space of time. It’s also very easy to copy and edit entire courses to re-purpose the learning content. So here we have an easy way to create lots of appropriate, well targeted and effective e-learning resources! The Shareable Content Object Reference Model is an e-learning standard initially commissioned by the US military in 1999. It’s very different to dynamically driven e-learning resources. It’s not easily editable as it requires each learning interaction to be a self-contained package, i.e. they don’t share the same source of learning content, so in order to edit the learning content of a set of interactions, it’s necessary to edit and re-author all the interactions individually which is quite a complicated and involved task. I wrote an earlier article about the pros and cons of SCORM on this blog. …or Why don’t videos of the same type, i.e. AVI, MPEG, etc., work on everyone’s computers? With broadband Internet connections becoming the norm, video on the web has become commonplace but beware, authoring video files for deployment on the web can be a minefield – WMV, FLV, MOV, MP4, F4V – There’s a dizzying array of video formats these days. In this article, I’ll take you through some of the terminology and possible problems that you might face when including video in your on-line lessons. Here is possibly the most common scenario for novice web designers and e-learning course content developers when using video: You’ve created a great video for your learners and deployed it on your chosen LMS (Learning Management System), tested it on a variety of computers with a variety of different web browsers and everything works fine. You feel like your done a good job – mission accomplished. However, you soon get feedback from learners that they can’t view the video on their computers. You check the different combinations of operating system and web browser and re-create their configurations but it still works for you and not for them. What’s going on? Don’t worry, everyone who has worked with video on the Internet has been there at some time or other. More often than not this is a CODEC issue. As some of you may already know, CODEC is an abbreviation of coder-decoder. Most simply put, it is the bit of your media player that converts the compressed video stream into uncompressed, watchable video. The most common CODECs in use on computers are: MPEG-2 (DVD), MPEG-4, FFmpeg, Theora and the new H.264 CODEC (Blu-Ray) which offers the best file size to quality ratio. Here is a list of current video CODECs. You’re probably already well aware that video comes in serveral flavours for the Internet. You probably heard of Flash Video, QuickTime, etc. The most commonly used media containers on the web are FLV, MOV, M4V, MP4 and AVI. For use with Flash and Internet in general, the most widely used and compatible is FLV (Flash video). As of Flash Player 10, Flash based video players can also support a variety of other media containers such as MP4, MOV and M4V. How can I find out which media container a video file is using? This does not represent the media container, it merely represents which default application (media player) your operating system will use to play the video when you double-click on it, for example Quicktime Player, Flash Player, RealPlayer, Windows Media Player (WMP) or Nero Showtime. You may have seen that the icons sometimes change when you install a new media player. In order to find out which media container the video is in, you need to look at the file extensions. These usually look something like: video.mov, video.flv, video.wmv, video.mp4, etc. In Windows, by default, the file extensions are hidden so that inexperienced users don’t inadvertently change them, rendering them unplayable. If you want to know how to display file extensions in Windows and why this is useful, you can watch this tutorial. What’s the most compatible way of deploying video on the Internet? Learners might not be using their own computer when they study, in fact, they might study on serveral computers at home, at work, at school, at university, at a library, etc. They’d have to download and install the media player or CODEC everywhere they went. Learners need administrator privileges to install software such as CODECs. The vast majority of computers at schools, universities, libraries and businesses only allow their IT guys to install software because of the security risks that it can entail. The good news is that the hard work has already been done for you by big Internet companies such as Google and Yahoo! All you have to do is follow their lead. The most universal video format on the web today is Flash video, also known as FLV. It’s difficult to find a computer, these days, that doesn’t have a version of Flash Player already installed on it. If it has Flash Player installed, it can play FLV video and the new Flash Player 10 also supports a number of other media containers – MOV, MP4, F4V, etc. – and supports H.264. FLV Cue Point data – This allows you to easily add dynamic captions to video. Dynamic means that the captions are stored separately as an easily editable XML file and can be changed or updated at any time without having to recode the entire video file. Here’s a starter tutorial for developers on how to deploy selectable multiple language subtitles with Flash Video. FLV Cue Points can also be used to trigger other events like playing a sound or animation, pausing the video and prompting the user to respond to something, and so on. Alpha transparency – This means that you can use “keying” (Chroma key), also known as green screen to make areas of video transparent so that you can layer it over different backgrounds. Lee Brimelow has recorded a video tutorial on the basics of including alpha transparency in Flash video using Adobe After Effects and Adobe Flash Professional CS3/CS4. It’s relatively easy to develop a custom media player in Flash that has specialised functions, for example a rolling transcript of the video dialogue, an on-screen menu system or any kind of interactivity, and an interface that matches the rest of your web site. What’s the easiest way to deploy video in Moodle? And finally, I’ve written a plugin module for Moodle, which leverages the very popular JW FLV Player by Jeroen Wijering. Once installed, it’s a matter of using the module wizard to select or upload the video you want to play and setting the player’s behaviour and appearance. It’s open source (free) of course and you can download it here. You can also see a variety of demos of it in action on my Moodle demo course (Login as a guest). I’ve just read this post by Phil Shapiro on his PCWorld.com blog. He certainly lays lavish praise on Martin Dougiamas‘ brainchild and life’s work, an LMS (learning management system) called Moodle. Here’s a global map of Moodle sites and list of links to them. Here’s a set of bar graphs and pie charts of Moodle site statistics. This article is a follow-up to my post, “Good quality audio”. Here, I’ll give a few tips aimed at new-comers to recording video for the web and how to get the best results. I’m assuming that, as a new-comer, you have very basic, low-budget equipment or are about to buy or borrow some. 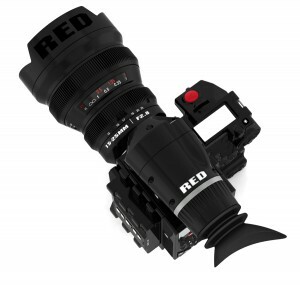 Obviously, something like the industry standard “Red One” from Red, starting at $17,500 for the body alone (not including lenses or recorder, although I’m sure they’ll give you a free t-shirt), is out of our budget. My introduction to recording video came when I was very young and my American uncle came to visit us in the UK. He brought an enormous VHS camcorder with him to record his visit for posterity and gave me, aged 13, the responsibility of being his documentary cameraman. Later, I went on to use the (enormous) old industry standard U-Matic video tape recorders, had some basic video recording and production training at art college, and eventually moved on to digital video with 8mm MiniDV recorders. The jump in picture quality from VHS, Betamax and U-Matic to MiniDV was astonishing. I’ve tried other formats since but, for the moment at least, I find that this format offers the best results for the money. Why do I recommend MiniDV? It’s an old format and surely the newer SD-Card or HDD video cameras are better, aren’t they? In my opinion, it depends what you mean by “better”. The newer consumer camcorders are cheaper (sometimes), smaller, lighter, more robust and often, you can take video shot on them and upload it directly onto video sharing websites like YouTube, with no editing or conversion software necessary. It’s wonderful to be able to do that. The downside is that these camcorders use an extremely high rate of digital video compression so while the footage shot on them looks good in its original format, once you start to edit it and, necessarily, recode it, it degrades rapidly. The end result is often unwatchable. MiniDV, on the other hand, uses a low rate of compression (MPEG-2) so that it’s possible to do more editing, recoding and adding special effects and still maintain reasonably good picture quality. Apparently, the BBC still use MiniDV for a lot of its mobile “rough ‘n’ ready” video. Be warned though, when you come to download video footage onto your computer, you’ll quickly fill up a good few Gigabytes of hard-disk space. You may want to consider installing bigger, faster (7,200 RPM minimum) hard-discs on your computer if you intend to do a lot of editing. Some of the new hard disk drive and SD card camcorders now include higher bit rate recording in the newer H.264/AVC (Advanced Video Compression) format currently being promoted by Sony and Panasonic. It promises double the rate of compression for the same olour depth and image quality. Although it’s popularly being hailed as the new de facto CODEC, most professionals are still using the older MPEG-2 CODEC simply because it’s more mature, there’s much better software support for it and it takes much less time to render edited videos into a final master copy. For example, most of the Blue-Ray disc movies available today are MPEG-2 not H.264/AVC. What should I look for in a video camera? Since we’re on a low budget, my advice is to get the best MiniDV camcorder you can. Something that surprises me about a lot of consumer camcorders, even quite expensive ones, is the lack of microphone inputs so that you can use external microphones to record sound. Some consumer camcorders come with the label “semi-pro” and they usually have microphone inputs and sometimes a “shoe” on which you can attach specialised microphones. Sound is one of the most important parts of the video recording as it contains the speech and the sounds that objects might make. It often carries the “story” of a presentation. Of course, it is possible to record audio separately and manually synchronise the sound and video streams while editing but this is a time consuming extra task that you could really do without. Ideally, you want a stereo input jack so that you can use a stereo microphone or a pair of mono mics. See my article on good quality audio for more details about this. Another important point with video cameras is the quality of the CCD (charged coupled device) chip. This is the light sensor that converts the light coming in through the camera lens into a digital video image. Needless to say, if the CCD chip is poor quality or has low light sensitivity, no amount of extra features or professional editing software can give you good quality video. The best quality chips use 3 CCD devices which give the best image quality and the best sensitivity, which is useful for shooting in low light conditions such as indoors. 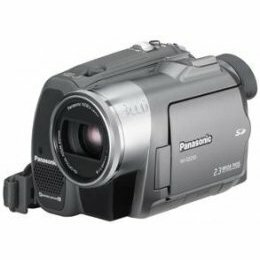 You can find a number of suitable MiniDV 3CCD camcorders of various ages, conditions and prices on shopping sites such as Amazon and eBay. I’ve seen good cameras on eBay for as little as £40. Update (19th July 2009): Now it looks like HDD camcorders are coming onto the second-hand market at an affordable price. I looked on eBay.co.uk and found quite a few good cameras selling at around the £200 (€230 or $330 US) price range. Before buying any camera, check with the camera manufacturer about what video compression settings the camera has and if they’re suitable for high-quality editing. Even the best of video cameras can only work with the light you give them. Low light conditions give you poor, flat, grainy image quality so it’s well worth investing in at least three good lights. I say three lights because subjects lit with only one or two lights tend to look rather flat and lifeless. Most people who work in photography understand the three-point lighting system. It’s effective and with a little experimentation and trial and error, you can bring your video footage (and studio photography) to life. The principles are simple. 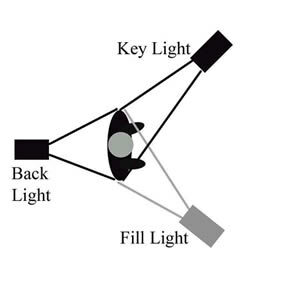 You have three lights: a fill light, a key light and a back light. This arrangement ensures that every area of the subject is lit and not in shadow and also gives a 3D effect, making the subject look more life-like. It’s an advantage if the lights give off a broad spectrum of light (i.e. fluorescent lamps or something similar) and even better if you can control their luminosity (i.e you can dim them). You may even want to consider setting up something similar for your webcam if you do a lot of VoIP and video conferencing. When choosing the best video editing software, I think there’s a trade-off between usability and editing features. Professional video editing software allows you to do just about anything you like with your video rushes to get some really impressive results. You usually have the option of using “keying”, also known as “green screen”, to remove the background. Even things like good-looking custom titling can only be achieved with professional software but the problem is that it’s difficult for a novice to use. If you’re new to video editing or have only ever used software packages such as Windows Movie Maker (included with Windows) or iMovie (included with most Macs), professional editing suites like Adobe Premiere Pro (Windows and Mac), Sony Vegas Pro (Windows only) or Final Cut Studio (Mac only) can be daunting and can take weeks or even months to get to grips with. Luckily, they all do consumer versions with intuitive, easy to use features that allow you to start creating your mini epics within hours, if not minutes. The trade-off is that most of the features are set up as pre-set combinations, for ease of use, and are either difficult or impossible to adjust individual feature settings in them to get the specific results you might want. If you’re technically minded and willing to spend the time and money and you want complete control over your editing features, then the pro options are the ones to go for. For fast and not bad looking results, go for the cheaper consumer options. Almost all video editing software has a convenient option for producing video for the web. Even Quicktime pro*, currently at $29.99, can convert a number of compatible formats to MP4 (H.264) for web deployment on Flash Player or the Quicktime browser plugin. By the way, I don’t recommend publishing your videos to the WMV (Windows Media Video) format used by Windows Movie Maker. It’s very difficult to deploy on the web reliably and a lot of people using Mac or Linux operating systems won’t be able to view it at all. I’ll write another article on video formats and media containers soon. * If you have Quicktime installed on your computer, you already have Quicktime Pro. All you need to do is buy a serial key from Apple to activate the media converter functions on it. I think getting physically good results in video is somewhat easier than in audio recording. Most camcorders today capture pretty good quality video so I think the most important thing to concentrate on is the storyline or how you storyboard your video presentation. It’s important to establish a context before going into detail. For example, if you’re doing an interview with a representative of an organisation, start with a short clip of the outside of their headquarters or something with their logo on before showing the interview. Also, don’t forget to introduce the representative and give a little background information about them before launching into the interview questions. All this is setting the context and it makes it much easier for your audience to follow who the person is and what is going on. Your video clips, no matter how short, should also have a beginning, middle and end. I think it’s best to think of it as taking your viewers on a journey. Whether it’s a visual journey or a spoken one, it’s still a good idea to let your audience know where they’re going to go, then where they’re going and then where they’ve been. Try to maintain a sense of continuity and a logical progression from one scene to the next. If possible, I recommend attending some kind of introductory course to video recording and editing. An experience professional can get you started, give you hands-on practice, teach you how to storyboard and edit, teach you the finer points of video technique, answer your questions and guide you toward producing some high quality and captivating videos.